Board Member, First Bank of Nigeria Limited, Honourable Commissioner for Commerce & Industry in Lagos State from 2011 to 2015, and Special Adviser to the Governor of Lagos State on Commerce & Industry from 2007 to 2011. Olusola has played major roles in improving the economy of Lagos State. She spearheaded the development of a number of greenfield projects, initiated schemes to improve the investment climate and led the drive to attract new investments to Lagos State. She is a fellow of the Institute of Chartered Accountants of Nigeria and Associate, Women in Management, Business & Public Service. 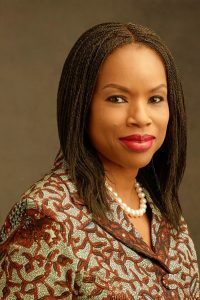 She had an enviable career in consulting and banking spanning over 20 years and grew through the ranks to become Vice President in one of the top-rated banks in Nigeria. Olusola Oworu is happily married with children and she is our FirstWoman.